When you're ready to hit paydirt, one of the greatest free RealTime Gaming games for you to check out is the Paydirt! slot machine. This exciting machine will make you feel like you're part of the gold rush. There are plenty of special features, including multipliers, free spins and wild symbols. This 5-reel, 25-payline slot machine is an exciting and fun option for all gamblers. Some of the symbols on the Paydirt! 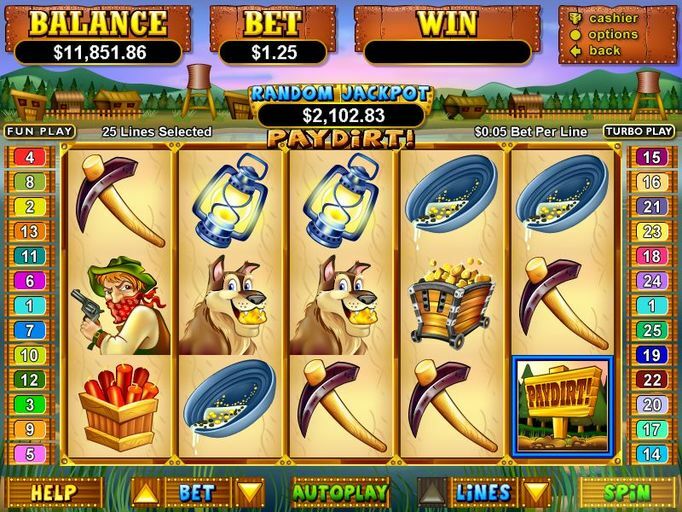 slot machine include miners, thieves, donkeys, mining equipment, dynamite and gold. The icons on the reels are beautiful and colorful, just like most of the graphics created by RTG. Some specific ones that you will want to watch out for include the gold nugget, which acts as the wild. It can substitute for anything else on the screen with the exception of the scatter. The gold nugget appears only on the second and fourth reels, and when one appears, the prize that is won will be tripled. The scatter is the Paydirt! sign, and when three of these appear on the reels, a "pick me" feature will be revealed. With this feature, you choose signs and each one you choose will reveal an exciting bonus round: Gold Rush, Gold Fever or Strike It Lucky. The Gold Rush option offers 12 free spins, the Gold Fever title offers five and the Strike It Lucky bonus offers five gold mines with bonuses hidden in each. You choose one of the mines and get 10 spins; the bonus symbols in these spins will all turn into gold nuggets. As you can see, there are plenty of chances to win with this thrilling title, and with all of the special features, you will surely be on the edge of your seat. This is a great option for anyone on any budget because you can choose a coin denomination from $0.01 to $5.00. Whether you've just started playing online slot machines or you're a seasoned gambler and want to check out the Paydirt! free spins feature or bonus rounds, you're going to love this one. You can try it out for yourself right now for free with the no deposit bonus available at Titan Casino. Just enter the code 25NODEPOSIT when signing up and you'll receive $25 to play with in your account. There has never been a better time to try and hit Paydirt!